In February of 2006, Bill, John P. and I had done the Crestones Traverse in a long winter day. During that trip, as we ascended the west side of Broken Hand Pass, I looked over at UN 13,270' (Crestolita), just south of the Crestones and Cottonwood Lake, and noticed what appeared to be a dramatic and aesthetic route up Crestolita's NE ridge. From my vantage I believed this ridge to be similar in nature to the Ellingwood Arete route on Crestone Needle-the ridge faced the same direction, was composed of the same Crestone Conglomerate rock and went directly to the summit. When we got home after that February day, I did as much internet research and polling of friends as I could but no one had any beta on this route and no one could even confirm it had been climbed? I asked myself, "Why?" Could it be poor rock? 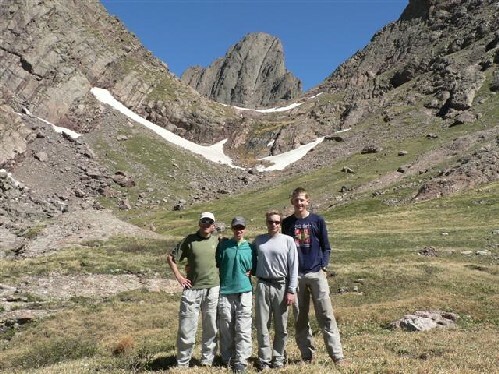 Could it be because the peak was very small and often overlooked compared to the neighboring 14ers? Could it just plain be a crappy route not worth mentioning? I really wanted to find out! So Bill and I decided we'd climb it this summer to check it out. Some photos made it look fairly low angle while other photos made the ridge look very dramatic. We'd carry a rope and a small rack just to be prepared for anything. 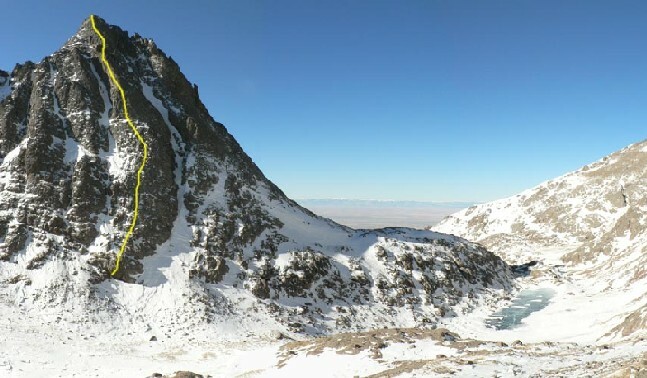 In early April, I began talking with Heather M. about doing the Crestones Traverse and realized that would be an ideal time to check out the NE ridge route on Crestolita. Bill was interested so we set the date. We later talked with Jeff and Allison Valliere about our traverse plans and they were able to join us for the trip. Three more friends of ours from Los Alamos, Scott, Amy and Paul, were also able to join us. The eight of us did the Crestone Traverse from Needle to Peak on Sauturday, June 10, before Bill and I could try the climbing on Crestolita on Sunday. Sunday morning at 5:05am we left our high camp at 11,100' in the Cottonwood Creek drainage heading up the steep headwall to gain the upper basin and Cottonwood Lake. Heather, Jeff and Allison were all still asleep when we left. Heather planned to hike out that morning while Jeff and Allison were "sleeping in" and then heading up Broken Hand Peak. Bill an I reached Cottonwood Lake around 12,350' at 6:55am and had a great view up our planned route. From this vantage it looked fairly low angle but from the summit of Crestone Needle the day prior, it looked very steep! One way to find out! We put on our helmets and harnesses and started the scrambling just left of a big overhanging roof just above the lake's east end. The initial 200 feet was fun scrambling on mostly smooth slabs. Thankfully the angle was low enough that roped travel was not necessary because opportunities for protection were sparse. Bill starting up the initial slabs. After the first 200-300 feet we reached a steeper pyramid-shaped wall that, from afar, looked quite steep. We were surprised to find the angle reasonable but even more surprised at the amount of features on the rock. The scrambling was getting good and we finally entered the direct sunlight. The morning was great thus far! This pyramid-shaped face gradually tapered into a thin ridge which offered more great scrambling to it's top at about 13,000 feet. To this point, the scrambling was mostly 4th class with the occasional low-5th class move thrown in here and there. 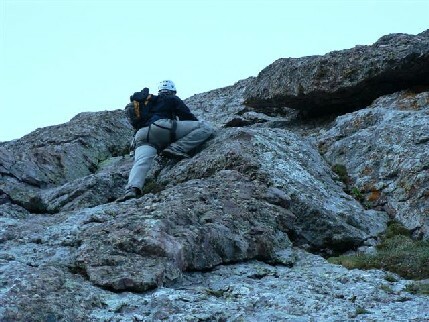 Seeking out the best holds on the steepest part of the ridge. We hadn't felt the need to change from our boots to rock shoes and definitely didn't need the assurance of a rope yet. We were having a great time! At about 13,000' the ridge drops down into a small notch where we needed to move right just a few steps to gain another rib that lead straight to the summit. This last ~300 feet of scrambling was very enjoyable and airy to the right side. 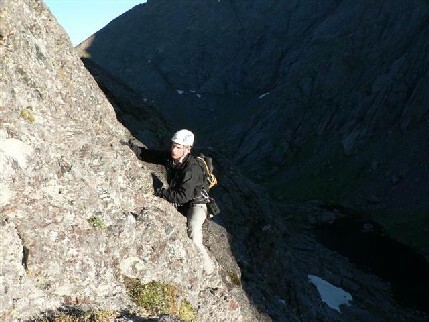 The scrambling on the upper ridge was very enjoyable! We worked hard to stay on the ridgecrest as much as possible to maximize our enjoyment and to take the most direct line to the summit. 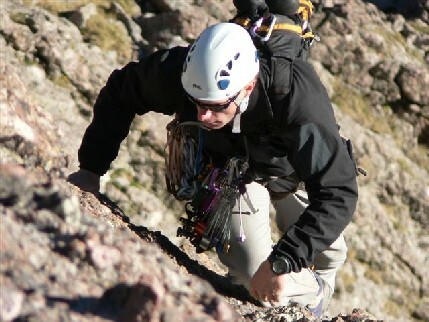 This was a great way to go as the scrambling was never too difficult and certainly a blast! At 7:20am the scrambling fun ended and we topped out right on the summit. 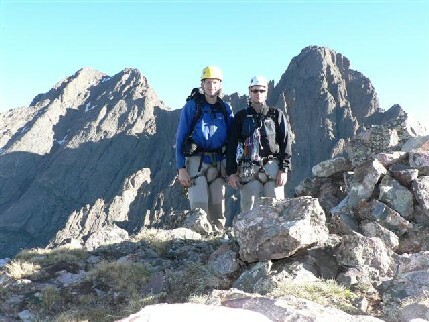 Posing on the summit with Crestone Needle and Crestone Peak flanking us. Since we were unable to find any mention of others climbing this route we decided to give it a name since "NE Ridge" sounds so plain. We called it "Analemma" because it's an ambiguous yet catchy name. We hope the name sticks! :) The views of the San Luis Valley were magnificent from this perch and looking north at the Crestones afforded us a fantastic new vantage on those magnificent peaks. It was a beautiful day with very little wind and no clouds in the sky. We signed the informal glass jar register placed by Ryan Schilling in 2004 and noticed on seven other signatures in the register since then. The day was young so we scrambled over to Crestolita's lower east summit before returning to the low point between the two summits and looked down the standard 3rd class gully route on Crestolita. We could see Jeff and Allison about 700 feet below on their way up Broken Hand Peak. We radioed to them, 10-4, and spoke with Jeff. 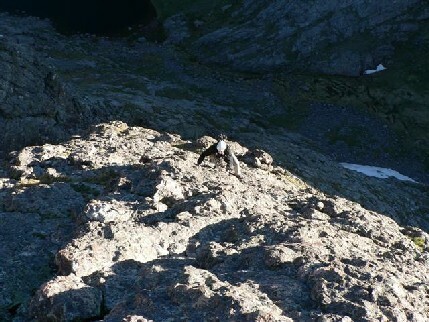 He invited us to join them on Broken Hand Peak and offered to "mosey" so we could get close. I knew Jeff's definition of "mosey" and knew we better move quickly if we intended to catch up with them. The descent down this north-facing, 3rd class gully on Crestolita wasn't super fun with loads of loose rock, but it was manageable. Just below the 12,800' foot level we exited the gully to the east and traversed over to the small saddle between Crestolita and Broken Hand Peak. We could see Jeff and Allison a few hundred feet above us as we stashed our heavy technical climbing gear and started to cruise up the west ridge of Broken Hand Peak. At 8:45am Bill and I joined Jeff and Allison on the summit of Broken Hand Peak and took in the awesome views of Crestone Needle's east face. Jeff talked us all into hiking over to another point along the ridge southeast of Broken Hand Peak which turned out to be a fun jaunt. Jeff had suggested descending south into the basin south of Crestolita and Broken Hand Peak and then hiking back to our camp along the stream. It looked wonderful and secluded in that basin so while Jeff and Allison headed straight down from the sub-peak, Bill and I retraced our steps back towards Broken Hand Peak so that we could get back down to the small saddle and pick up our gear. After picking up our gear we dropped south into the basin to rendezvous with Jeff and Allison. Bill and I enjoyed some ski-glissading on our way down into the basin and hooked up with Jeff and Allison around 12,400' feet where they were enjoying the most amazing view of Crestone Needle that any of us had seen. The needle was framed perfectly by the small saddle between Crestolita and Broken Hand Peak. From this vantage the needle appeared larger than life and completely dominated the sky! All of us took a ton of photos hoping that just one would come close to doing this view justice! Jeff, Allison, Bill and I posing in front of the very nicely framed Crestone Needle. After the big photo shoot we carried on down the basin staying on the basin's north side as much as possible. As we descended towards camp we marveled at how isolated and private the small ponds and meadows felt in the basin. Jeff vowed to return to camp there sometime. We never found a great trail until we were nearly back to camp but bushwacking was minimal and we were back to camp by 11:00am very satisfied with a leisurely morning of exploring and adventure hiking with some great friends! Written by Jason Halladay on 16 June 2006.